Linda Kruger-Small was driving home on a rainy night, just a few days before Christmas 2008. She was on an unfamiliar street and followed a right turn arrow that put her on railroad tracks at Orangethorpe Avenue in Anaheim. It turned out to be a fatal move. Her car became stuck on the tracks as a train barreled toward her. She dialed 911 to ask if the train could be stopped. Moments later came a horrible collision. Passersby pulled Kruger-Small from the wreckage, but it was too late. Railroad Crossings: Family's "Worst Fears"
A family describes the moment they learned that their "worst fears" came true and their efforts to help save the lives of others. 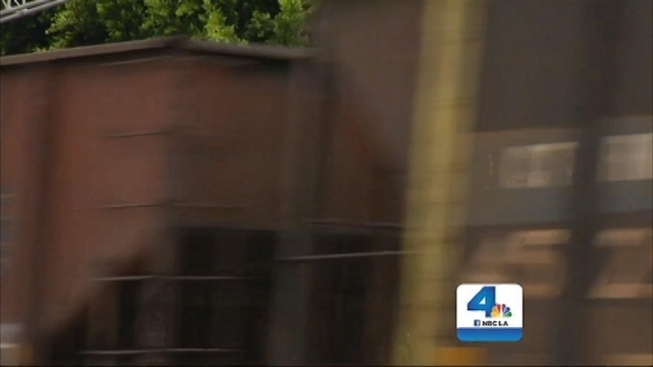 Whether it is deceptive or not, the Federal Railroad Administration says there are 24 rail crossings in Southern California that are even more dangerous than the one where Kruger-Small was killed. The most dangerous train crossing in California is where Nogales Street crosses the tracks in Rowland Heights. According to a new federal report, it is the third most dangerous crossing in the United States. Forty-thousand cars cross the tracks, over which 52 trains rumble each day. A federal database rates thousands of crossings across the country, predicting the likelihood of accidents happening there. There have been seven accidents at the Nogales Street crossing in the past five years, including one that happened earlier this month. In that crash, a Union Pacific freight train rammed into a semi-trailer that was hemmed in on the tracks by heavy traffic. "Cars routinely stack across the railroad tracks and sometimes those vehicles can’t get cleared out fast enough when these trains go through,” said Marc Christoffels, of the Alameda Corridor, the railroad express line that connects the ports of Los Angeles and Long Beach with the rail network just east of downtown LA. Work is underway to make that crossing safer. More than $100 million will be spent on an underpass to keep traffic from driving across the tracks. Twenty-two other crossings are also scheduled for safety improvements over the next 10 to 15 years. It’s all too late for the family of Linda Kruger-Small. They want drivers to always be vigilant when encountering a railroad crossing. “She didn’t get to see the birth of my daughter. All these things that would have made her so happy,” said her son Phil Krueger. To see how safe the crossing in your neighborhood is, click here. NBC4's Phil Drechsler produced the broadcast special report that accompanies this article.